With valuation of startups crossing billions of dollars, ecommerce roaring high and platforms altering their prices every second day, several business ideas lie undeveloped and wait for the right time to start. YoKart, the multi-vendor system will soon bring that ‘right moment’ in the lives of 100 entrepreneurs with its rare event, ‘YoKart100StartUps’. Any of you- established businesses (offline/online), student entrepreneurs, ecommerce buffs, professionals, startup dreamer, etc. can be one of those hundreds whom the company will give FREE license to build a new store with YoKart. YoKart has decided to make 2016 special for ecommerce by fostering growth of more startups and giving them a kickstart for ZERO cost. To launch an ecommerce marketplace, you need a pertinent technology first but the cost of high performing ecommerce platforms seems inflated to first-timers. It can’t restrict your vision but it delays the seeding of a new business. With a motive to kill this delay, YoKart, the award winning ecommerce platform announces to give away 100 FREE License, in 24 HRS for $0. The event brings 100 licensed copies for prospective startups at no cost. Yes, you heard it right; 100 free copies of YoKart worth $99900. You can check the GoQuick package to know more about this copy. What makes it so special is the fact that it is neither a challenge nor a contest. This means that in order to become eligible for your free copy, all you have to do is register with us and share a little about your business that will be nurtured by YoKart’s FREE license. Full/Default version of our award winning Multi-vendor ecommerce portal having single Domain Non-Exclusive License (Terms and conditions applied). One year of free post-delivery support via Email or Project Management System for fixing bugs/errors. Framework documentation for your programmers to learn using the framework. This would also help them make any modifications or enhancements into the system without having to hire FATbit/YoKart team. The entrepreneurs just have to fill the signup form in order to be a part of this mega event. 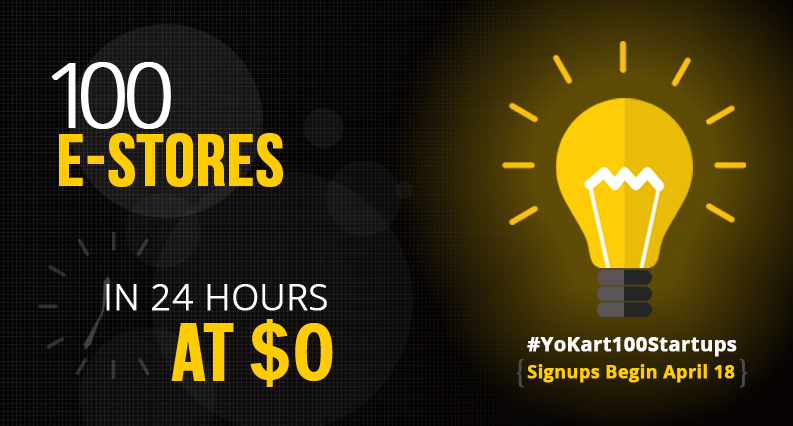 100 subscribers who will get the free copy of YoKart should have a business plan and domain registered for it. The license will be given for the domain shared by you so you can build site on the said domain only after receiving the FREE copy of YoKart. Winners will get an email with a link to claim the copy that will remain active only for 24 hours after the declaration of results. The delivery period of the licensed copy is one month after the results are declared. For more information about the event as well as terms and conditions, visit here. YoKart has been the go-to name for entrepreneurs looking to launch their own multivendor ecommerce marketplace. This event has just added a new feather to its mantle, offering entrepreneurs a robust ecommerce platform that does not cost a penny. 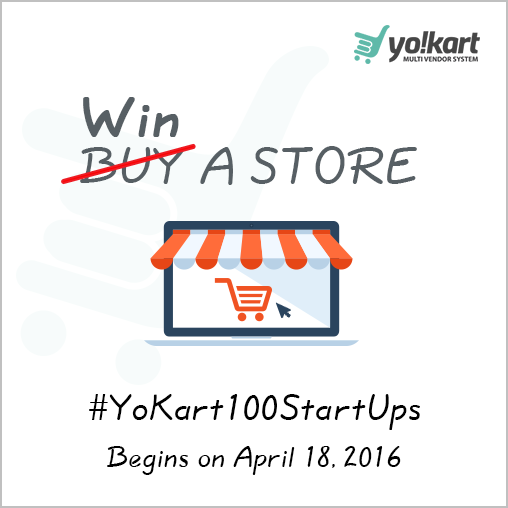 Check more about #YoKart100startups on Facebook or Twitter and remain updated about the event. P.S. The right time has arrived to begin your ecommerce journey. I have entered your amazing contest and I really hope I become one of the winners. That would be awesome. Thank you for creating this contest.